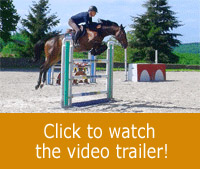 This course is a succession of jumps taken at an angle with sharp turns upon landing and long distances. 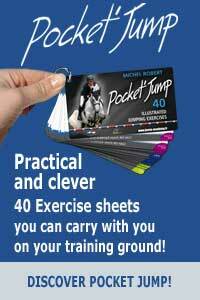 It’s an excellent training exercise for horses and riders for speed challenge’s courses. This exercise is also very good for the rider’s mental preparation as he has to focus on the quick succession of lines and turns while staying alert with his ride. At the same time, the rider is not anxious about the height of the fence allowing him to stay focused on the given priorities such as his position. In the session, Michel rides Tosca, a young mare who is 7Yo. The success of this exercise lies on the rider’s ability to anticipate the movement and to stay balanced and steady on his horse. Indeed, the rider has to stay centred above his feet and his horse’s centre of gravity. The “centred or in between position” which is the “ready to do it all position” enables the rider not to be caught off-guard by the rapid succession of straight lines and turns. We can notice how fluid Michel’s position is: always in the movement forward and in harmony with the movement of his mount. His position on landing allows him to be ready for anything along the course. The rapid succession of the different elements of the exercise requires the rider to anticipate each of his actions.